Let’s tackle the dirtiest part of the house. You know that room we take one look at and turn around and close the door in a moment of fight or flight. Wait. Is that just me? Let’s just pretend this is a global mom thing. I’ve confessed before, but it’s worth mentioning just one more time…I don’t like cleaning the bathroom. It’s the one room of the house that strikes pure terror in my obsessive compulsive heart. Maybe it’s the fact that we have a wonderful four year-old boy living under our roof (we shall leave it at that…I think you get the point). Or the fact that our tub seems to throw mildew parties on a weekly basis and leaves all the evidence behind for me to clean up. Ah, yes. The bathroom. Whatever the cause of my bathroom cleaning reservations may be, the dirty job must be done quite regularly in order to maintain a sense of cleanliness for the good of all. Before having kids the dirty job could easily be accomplished with a washcloth and some water. I know, probably not the best cleaning method, but the bathroom was rarely used when both Dustin and I worked outside the home. Not to blame the kids (because I love my kids and don’t want them to have adult therapy sessions because of mommy’s bathroom issues), but well…the evidence is clear. The bathroom cleaning job is a bit more necessary during this season of life. 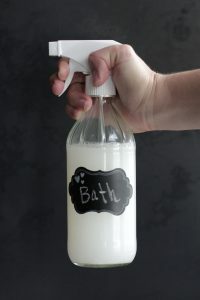 In my quest for a clean(er) bathroom, I created a powerful bathroom cleaner that works against even the most stubborn odors and dirt. That cleaner (which is amazing and you really need to check out!) is the go-to homemade solution for my weekly appointment in the bathroom. There are times when the job gets really dirty! So dirty I need a bit more help than my trusty homemade squirt bottle can provide. It’s in those moments that I turn to soft scrub. Baking Soda: Baking soda is one of the most effective cleaning ingredients available. This inexpensive ingredient can be used to raise my favorite banana bread and clean a toilet. Pretty amazing stuff! When used as a homemade cleaner, baking soda absorbs odors and scrubs away stains due to its abrasive properties. I use Bob’s Red Mill Baking Soda for baking, but go with the cheaper bulk bag of Arm & Hammer for cleaning. Castile Soap or Sal Suds: One of my favorite multipurpose DIY ingredients. Castile soap is a concentrated vegetable-based soap with easy to recognize ingredients. I use castile soap for everything from homemade laundry detergent to hand soap and face wash. While I love castile soap, I often purchase castile soap’s cousin, Sal Suds, for tough cleaning jobs. Sal Suds is tougher on grease and stubborn stains than castile soap. Hydrogen Peroxide: Hydrogen peroxide is known for its antiviral and antibacterial properties, making it the perfect cleaning ingredient for a dirty bathroom. Hydrogen peroxide takes a bit of time to work so I let my homemade soft scrub sit for a few minutes before the victorious act of scrubbing away dirt and stains. 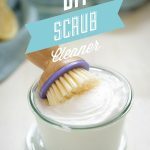 With three simple, cost-effective ingredients homemade soft scrub conquers even the most stubborn bathroom odors and grime. Plus, the act of mixing the ingredients takes less time than a trip to the store to purchase a bottle of the alternative, which means with the extra time you can hide out in a clean bathroom with a homemade latte and good book! Wait. Am I the only mom enjoying quiet time in the bathroom? Nah, I’m sure it’s a global mom thing. Soft scrub is an amazing product that works on even the toughest dirt and mildew. 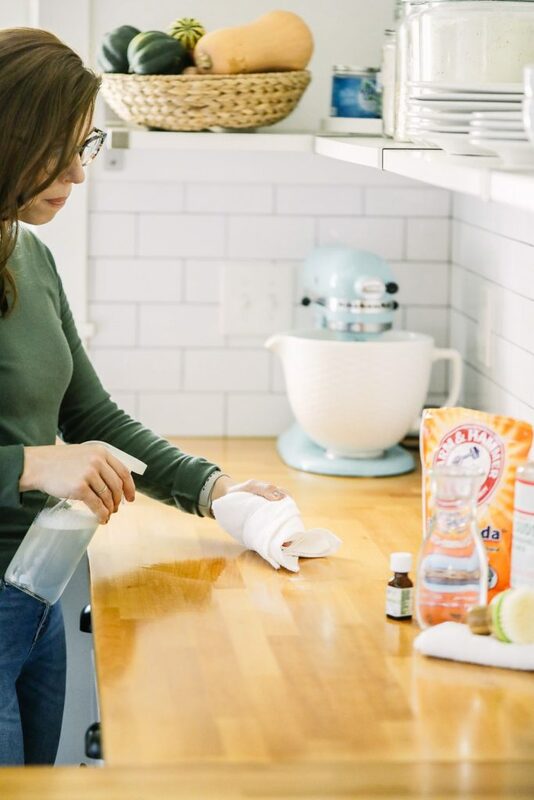 Thankfully, making a homemade version of the popular cleaner is as simple as combining three dirt-hating ingredients. 1 large jar with a lid or Mason Jar, the jar pictured is a Weck Jar. In a medium-size bowl, combine the baking soda, castile soap or Sal Suds, and hydrogen peroxide. Stir until the scrub cleaner looks like thick glue. Spoon the scrub cleaner in a large jar with a lid. Seal the jar. This cleaner will harden when exposed to air for a prolonged period of time. The scrub cleaner can be used immediately and kept at room temperature (in a sealed jar) for several months. Note: It's important to leave room at the top of the jar for expansion. The cleaner will expand within the first 24 hours. I leave 2-3 inches at the top of the jar for expansion. To Use: Apply the amount desired to a cloth or scrub brush and apply to a dirty surface. Allow the scrub cleaner to sit for a couple of minutes. Wipe the surface with a damp cloth. That’s funny- just this morning i was cleaning the bathroom and thinking ‘I need something more concentrated’ – this sounds perfect! Hi Kristin! I just used this recipe to clean my shower and it really works! I added some grapefruit essential oil to give it a fresh scent, and my shower smells so clean! It really cuts the soap scum! I’ve shared this with a friend. Thanks for sharing! Blessings from Bama! That’s awesome, Felecia!! I’m so happy the homemade scrub cleaned your shower so well!! I’m just thrilled with this soft scrub. I used it on my bathroom tub and sink. It works 10x better than just baking soda and vinegar, and smells 100x better. Has very concentrated powder so it uses much less resource too! Fantastic! That’s awesome, Bethany! Thank you for sharing. Kristin, this is FABULOUS!! I just made this today and used it right away. It works wonderfully well. So well, in fact, that I called my children from their school work to see our beautiful bathroom! It even made my stainless steel kitchen sink sparkle…and that was just from using what was left in the bowl from making this! I doubt I will ever go back to commercial cleaner. As another reviewer said, this does work so much better than vinegar and baking soda…and a little goes a LONG way. Thanks for the recipe! Hi Kristin! I made this recipe and few weeks ago, in the hope that it could solve a kitchen cleaning problem I have been struggling with. And it did! I have a glass top stove, and every time I cook, it gets terrible baked on rings around the burners. I have tried every homemade concoction to get rid of them, with no success, and I simply will not by the highly toxic, highly stinky cleaner that does remove them. Needless to say, the baked on rings were getting pretty bad. I made this scrub, added a few drops of lemon essential oil, and WOW! Not only did it remove the rings, but my stove looks brand new…we’re talking super sparkle! Thank you so much! This stuff is great! Thank you so much for this amazing recipe! I have been looking for a recipe like this for a long time! I think I doubled or tripled it when I made it and thank goodness I put it in a huge mason jar because boy, did it expand as you said it would! I absolutely LOVE this stuff! The scent of the store bought stuff brought tears to my eyes I couldn’t stand it! This stuff smells heavenly and boy, it sure packs a punch and gets the work done! I can’t thank you enough. Thank you so much for sharing, Tricia! I’m so glad you love the scrub cleaner!! Great recipe! Thanks for sharing it. So when you say a sealed jar, you just mean an air tight closed jar right? And it doesn’t harden if you keep it closed tight? Hey Natalie, Thank you. Yes, just something to keep the scrub from being exposed to the air. The solution won’t harden in a sealed jar. Happy New Year. Thank you for the recipe. I recently found your blog and am inspired. I have a question though. Can I use vinegar instead of hydrogen peroxide? Hey Elena, Castile soap and vinegar can’t be mixed. You could use Sal Suds, but baking soda and vinegar are also a problematic mixture. The best option would be to skip the hydrogen peroxide. 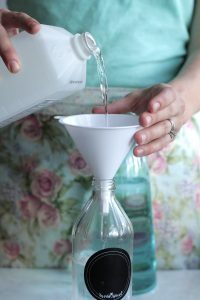 Here’s more information about combining ingredients: https://livesimply.me/2015/11/18/4-natural-cleaning-ingredients-to-avoid-combining/. I just learned about cleaning with hydrogen peroxide and found your site when I was looking for “recipes”. I’m enjoying so many of your diy cleaning products and other information! I have one question though, I have heard that hydrogen peroxide needs to be in a dark container to remain effective/stable. Is that true in your experience or does it not really matter for these purposes? Thank you! I love love this cleaner. Just made the scrub last night and I cannot believe how clean my bathroom and kitchen sinks are! Next is the bathtub. I have always dreaded cleaning the bathrooms and I think the reason is the toxic chemicals. I am tossing away all my toxic cleaners out. 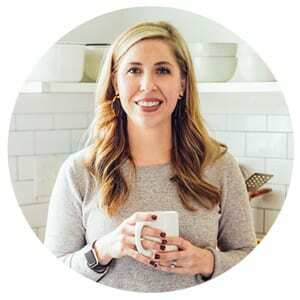 I spend at least an hour a day on your website and I am learning so much! Hey Denise, I’m so glad you’re enjoying the scrub, and cleaning your bathroom!! And I’m glad you’re enjoying the information on Live Simply! Thank you for sharing. Hey Jann, I’m not sure if this will work in the bottle due to expansion. You could try adding a bit more Castile soap to make it easy to squirt. I have been loving this soft scrub! It is also totally awesome as a grease remover for those who work on cars. It took the grease off my hands without major scrubbing, harshness, or smell. I love it! I am going to try and make this. What is the shelf life? It almost looks like you mixed it with a mixer. I’m assuming it can be done by hand. Thanks! Hey Elyn, I mix this by hand, using a wooden spoon. This will last about a month, from my experience. The only product with a delicate shelf-life is the hydrogen peroxide, so you can either place the scrub in a darker air-tight container, or skip it (for the longer shelf-life). Enjoy! I make up batches of this but without the hydrogen peroxide. I keep bottles of hydrogen peroxide in the kitchen and bathrooms for those cleaning jobs that need some extra horsepower. BTW: next time you are about to throw out a spray bottle, keep the spray top and use it in place of the screw on top on a hydrogen peroxide bottle. You get the convenience of a spray but don’t expose the hydrogen peroxide to light. Love it, Mandy Cat! Thank you for sharing :)! And to think I just spent a good 15 minutes this morning trying to scrub the shower with just baking soda! I will give this a whirl next time! Great idea, Stephanie! I should probably add that task to my daily routine. Definitely try the scrub. The combo of all the ingredients really adds an extra POW to tackling the shower or tub. I was wondering if I could add some Lemon essential oil to this to make it stronger or if that would be to much. Hey Jenelle, Definitely! That would be a great addition! This stuff really works great on soap scum! Thanks! Hey Kelly, Yay, I’m so glad you’re enjoying it! The lemon juice is an acid, so it will react to the baking soda (although it’s a very small amount). You could skip the hydrogen, and not replace it with another ingredient. Or, you could add some lemon essential oil. I made this a few weeks ago with great results, and it smelled lovely at the time. However, after a week or two in a sealed mason jar kept in the dark under sink area, it smells absolutely horrid! Any idea why? My ingredients were all brand new, the essential oils a very good quality brand. So sad! Hey Shannon, Oh no, I’m so sorry to hear that! I wonder if the essential oils conflicted with the hydrogen peroxide? They shouldn’t be an issue with the baking soda or castile soap. Did you use a scented castile soap? Maybe that was an issue with the essential oils. Hi Kristin! You have a fan from the UK here! Just wondering – what percentage hydrogen peroxide do you use? I have found percentage solutions ranging from 3% to 30% when shopping online. Thanks! Hey Eliza, It’s so great to meet you! I use 3% :). Thanks! Love your site :). Hey Eliza, I’m so glad you’re enjoying the scrub! This stuff is a game changer if you have a white sink. I tried for years to use natural products to get our sink white and could never find anything that really worked until this easy recipe came along…it is amazing! I printed out the recipe and taped it to the inside of the cleaning cabinet so I have it handy when I need to make a new batch. I also use this on our bath tubs and it works great, plus I have piece of mind that our girls are not being exposed to any harsh chemicals that could be left behind when they take a bath. The best! Just make it! Can I use super washing soda? Hey Alta, I don’t recommend it. The washing soda will harden and be hard to remove from the jar and surfaces. Hey Laurie, Yes, you should be able to. It does harden. Thanks, I won’t use it. Hey Alta, Which part hardens? This is so good like I tried it this morning! Showed it to my mom also and she’s happy that she found the solution to her worries. One question though, is there anything that we can used to substitute the castile soap since it’s quite hard to be found here? Thank you! Hey MSB, I’m so glad you’re enjoying it. You could leave it out entirely, or use a natural dish soap. This product works! Highly recommend! how much or cups should i use Sal Suds instead of 1/4 cup castile soap? Hey Ayca, Maybe try a couple of tablespoons? Would this be safe to use on a sealed granite countertop? Thank you! Hey Leah, I believe so, but I would test a small area first.